This book takes a unique look at visual character development in motion pictures and television by using famous works of art combined with modern works of film and television to demonstrate how to weave a visual tale. In a single shot or scene, what should we reveal about a character? What should we conceal? How can we show a character’s progression over time? In Visual Character Development in Film and Television, authors Michael Hanly and Elisabeth Rowney explain how to create compelling visual characters for the screen by analyzing fine art aesthetics and combining them with modern cinematic techniques. 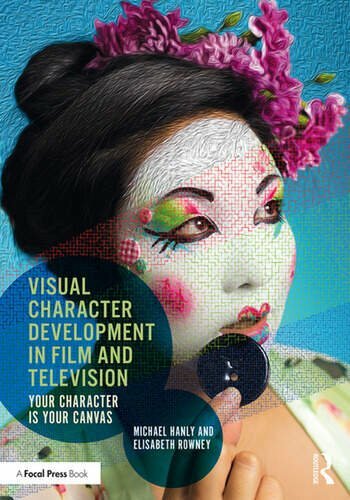 Full-color chapters cover character-driven approaches to costume design and makeup application, production design, cinematography and lighting, plot development, editing considerations, and more. By exploring how surroundings, habits, lifestyles – even the color of a sweater – can tell us more about a character on the screen than what can be said in dialogue alone, this book will prove a valuable resource for anyone wanting to take their filmmaking to the next level. Michael Hanly received his B.A. in Cinema from Columbia College, Hollywood, CA. Building upon his degree and experience in the industry, Over the past 17 years, Michael has taught Advanced Film Production, Advanced Postproduction, and Screenwriting for the Film Bachelor of Science at Full Sail University, and has earned an M.S. degree in Entertainment Business. He is currently working in the Digital Cinematography Bachelor of Science program as Course Director for classes ranging from Fundamentals of Production, Portfolio Creation, and Film Criticism. He is COO of Silver Screen Paradise. A non-profit organization dedicated to promoting the history, art, and creation of visual storytelling through Sci-Fi, Horror, and Fantasy. Elisabeth Rowney received her B.A. in Art History from Florida State University, and later obtained an M.A. degree in Art History from the University of South Florida. During her studies, she spent time in Paris and London and volunteered at numerous museums including Goodwood Plantation and Museum, St. Petersburg Museum of Fine Art and the Orlando Museum of Art. After four years as an Associate Professor of Art History, Elisabeth is currently the Course Director for Art Design and Location Shooting within the Digital Cinematography Bachelor of Science program at Full Sail University. As well as writing prior essays about Auguste Rodin for Smarthistory and Khan Academy, Elisabeth is a published photographer and CEO of Silver Screen Paradise.